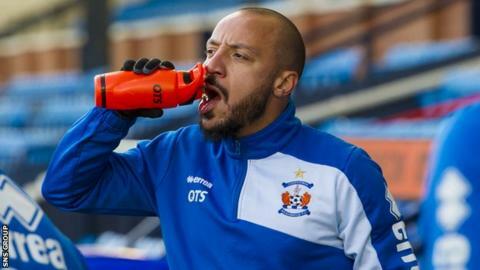 Former West Ham defender Julien Faubert has signed for Kilmarnock for the remainder of the season. The 32-year-old Frenchman joined the Rugby Park team on trial this week after a spell training at Premiership rivals St Johnstone. He has been without a club since ending his second stint with Bordeaux last summer. Faubert, a loan signing for Real Madrid in 2009, is new manager Lee Clark's first signing for the Ayrshire club. "The manager has just arrived and he has taken a chance by signing me so I want to show him and the club what I can do," said Faubert. "I can break my neck for this kind of manager because he has taken a risk. The best thing I can do is repay him on the pitch." And there could be more free agents on the way in at Kilmarnock. "This week, because we have had no game, it's been an opportunity for me to look at four or five players with the contacts I've got around Europe and the world," said Clark prior the the announcement of Faubert's signing. "Not singling out individuals, but we've got the opportunity to look at players. Out-of-contract players are the only players we can sign at the moment but I'm obviously looking for the summer now as well in terms of players we can go for." On whether or not players would be brought in straight away, the former Huddersfield boss said: "We'll see. They have got to be up to the required level and got to hit the ground running and go straight into the team." Explaining Faubert's departure from McDiarmid Park on Tuesday, St Johnstone boss Tommy Wright told BBC Scotland: "We just felt match fitness was something that we couldn't wait for."